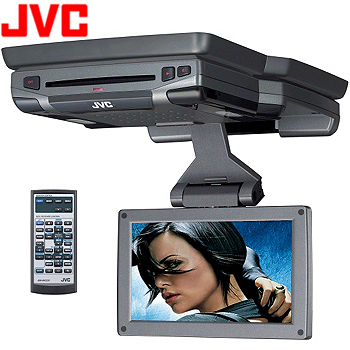 "JVC 9 INCH WIDESCREEN MONITOR DVD PLAYER (BRAND NEW)"
TURN YOUR VEHICLE INTO A MOBILE ENTERTAINMENT CENTER! The KV-MRD900 9' widescreen monitor with built in DVD player from JVC brings new light to the world of back seat entertainment. Equipped with newly developed 3-D technology allowing back seat viewers to optimize the viewing angles both vertically and horizontally placing the action in front of the viewer, which provides a true movie theatre experience. The large, 9' diagonal, 16:9 widescreen LCD delivers clear, high quality images at an amazing 336,960 pixel resolution. Dual VTR inputs (RCA) provide simple connection for gaming consoles, TV tuners, camcorders or any other video input device. Deliver audio to your car stereo system via the included FM transmitter or listen in privacy with the included IR wireless headphones. Experience movie theatre quality sound with the built-in Dolby Digital / DTS decoder. The built-in DVD player is DVD-R/RW, VCD, and CD-R/RW compatible. The KV-MRD900 can play MP3/WMA music files burned on DVD. The 4.7GB capacity of DVD stores up to approximately 1,000 songs (GIGA MP3) on a single disc equal to 100 pre-recorded CDs. Bring along all of your favorite songs and movies and make your next family road trip entertaining with the KV-MRD900.